Posted on 4th December 2018 at 7:05 pm. We had a busy time last week on our London visit decorating two Christmas windows . Our shop is now ready to host our clients coming in over the Festive Season. Our mannequins are wearing 3 new outfits made especially for autumn and winter weddings . One Mum is dressed in a long sleeve ivory crepe dress with crop beaded top accessorised with faux fur collar cuffs and Cossack hat and the other has a beaded embroidered dress with crepe swing coat over with faux fur collar and cuffs finished off with a Cossack hat. Our bride in the centre has a new fishtail lazer cut applique dress with lond sleeves , boat neck and deep V back. To keep the cold out we have designed a crepe cape with faux fur trimmed hood. Our neighbours in Haverstock Hill will be surprised to see our day dresses have popped up in the window of Crumlin’s solicitors next door at No 77. 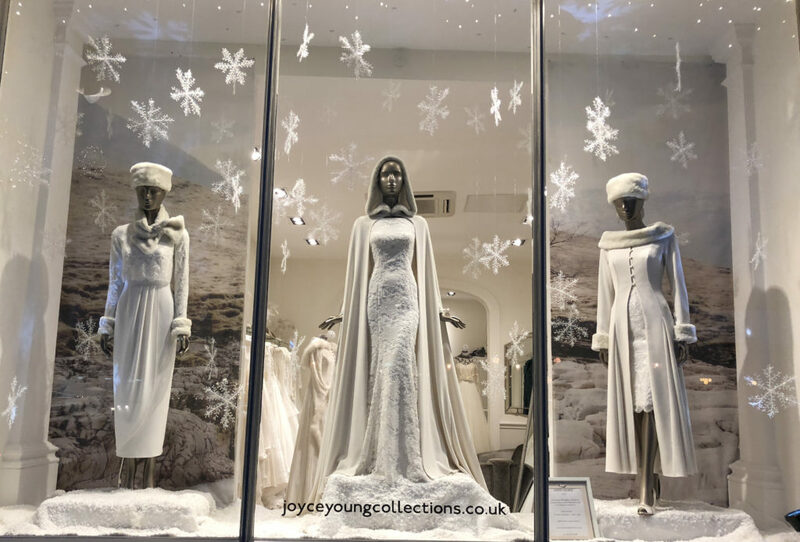 We are delighted to be able to decorate this fantastic space for Christmas and have an opportunity to display our daydresses. Alongside our day dresses we have faux fur collars and cuffs with tartan or tweed linings. Also some stunning hand made jewellery and Tessa Williams candles and room sprays . All perfect presents for Christmas. In Glasgow we are also in Festive mood and our phone number there is 0141 942 8900 ext 1 . Glasgow shop will be closed from Monday 23rd to 26th December inclusive and open 27th ,28th, 29th December . Closed for New Year 31st Dec , 1st and 2nd Jan and open for business as usual from 3rd January 2019. 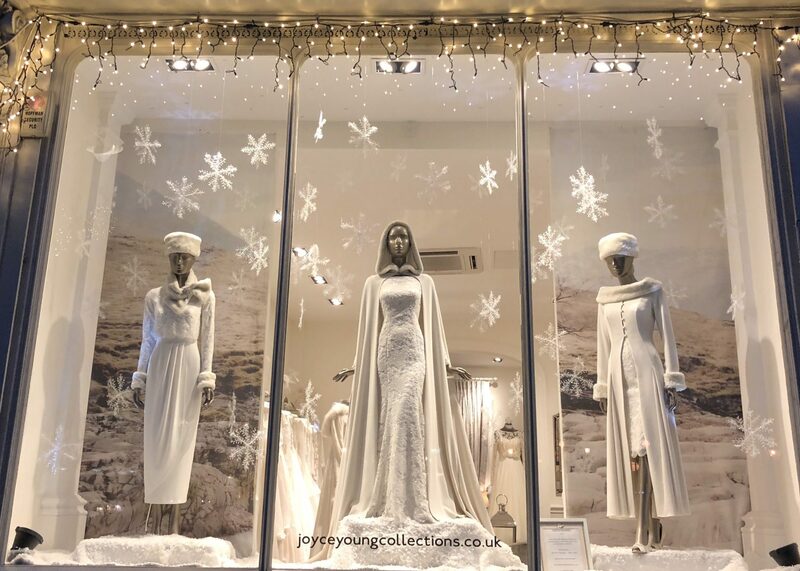 Christmas window 2 Joyce Young day dresses stray into next door Solicitor’s window !